(186 x 263 mm) 8.3 x 11.7 in. A4 Mounted 7.3 x 10.4 in. (186 x 263 mm) 11 x 14 in. (254 x 361 mm) 12 x 16.9 in. MEDIUM 14.7 x 20.8 in. (372 x 530 mm) 17.5 x 24 in. 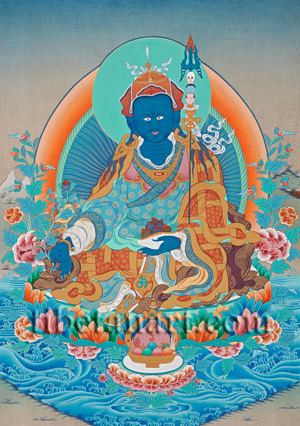 Orgyan or Urgyan Menla is a special aspect of Guru Rinpoche (Padmasambhava) who manifests in the form of the Medicine Buddha, Bhaisajyaguru, the supreme physician. He is slightly wrathful in appearance, with two piercing eyes, and a radiant deep blue complexion like that of the vaidurya or blue beryl gemstone. With his left leg drawn up and his right leg slightly extended he sits in the posture of royal-ease upon a white moon disc and a multicolored lotus of many petals that arises from a lake. Orgyan Menla's 'lotus-hat' is fashioned from red and orange silk, with folded upward-pointing flaps on both sides, and a central crest with five cloud-like curves. The beading of this hat's flaps, crest and headband are coloured dark blue and white, and the crest's interior is marked with five small orbs. Above this are the symbols of a white crescent moon and a golden sun, and the top of his lotus-hat is adorned with small silk valances, a half-vajra bound with a white silk ribbon, and the crowning emblem of a white vulture feather. He wears golden earrings, bracelets and a necklace bearing a reliquary-box, felt boots with golden trimmings, and his dark brown hair hangs freely about his shoulders. As clothing he wears a white undergarment that represents the Mahayana vehicle, a blue robe with a copper-edged 'cloud-collar' that represents the Mantrayana vehicle, and a patched orange robe that represents the monastic Hinayana vehicle of pratimoksha vows or moral discipline. Outside of these three robes he wears a loose dark maroon cloak that represents his perfection of all vehicles or paths to enlightenment, and to emphasize this all of his robes are richly embroidered with golden designs. With his right hand resting upon his knee Orgyan Menla makes the varada-mudra of supreme generosity, with his index finger and thumb holding the budding stem of the medicinal myrobalan or ink-nut tree (Teminalia Chebula). The fruit of this tree is widely used as a panacea in both the Indian Ayurvedic and Tibetan medical traditions, where it is known as haritaki (Skt) or arura (Tib). His left hand rests upon his lap in the dhyana-mudra of meditative equipoise as he holds a skull-cup containing six myrobalan fruits and their leaves. In the crook of his left arm he supports the blue-black bamboo shaft of his tantric staff or khatvanga, which is adorned at its top with a crossed-vajra, a nectar-filled vase tied with a billowing white ribbon, three impaled heads, and an iron trident with a blazing central prong. The three heads represent the 'three kayas' and consist of a freshly severed pink head (nirmanakaya), a decaying blue head (sambhogakaya), and a dry white skull (dharmakaya). The lotus and moon disc that arises from the lake in front of Orgyan Menla supports a golden bowl that contains jewels, the emblems of the chakravartin, and a heart-shaped sacrificial offering cake (Tib. torma) framed by a golden mount that bears the emblems of a crescent moon, a golden sun, and a dissolving point or bindu.